Tracking shots typically involve moving the camera on a platform running on tracks, towards a subject or away from it or from side-to-side. R.W. Paul devised panning and tilting with horizontal and vertical movement to keep focus on a fixed action within the frame for the coverage of Queen Victoria’s Diamond Jubilee in 1897. The connotations of movement change perspective and to give psychological insight into the psychology of a character or their point of view – use of camera movement can also add to the sense of spectacle. One of the first was the unchained movement in Murnau’s LAST LAUGH (1924). The travelling shot gave dynamism to films such as CABIRIA (1914) to such an extent that its diagonal-tracking shot became known as the ‘Cabiria movement. The arrival of the talkies briefly stopped the movement of the camera due to the squeaks and the whirrs. APPLAUSE (1929) restored the use of parallel tracks with blimps to muffle the sound. Elevated movement became popular in musicals such as 42ND STREET (1933) where Berkeley, famous for his overhead shots used an elevated tracking movement. Hand-held cameras were originally used in cinema-verité were used in New Wave cinema in the 1960s to bring increased immediacy to the action. The introduction of the stedicam in 1976 made the movement smoother. Now, movie use a variety of remote controlled rigs and digital technology to create fluid, long take, tracking shots. A policeman’s job is only easy in a police state. That’s the whole point, captain. Who’s the boss, the cop or the law? 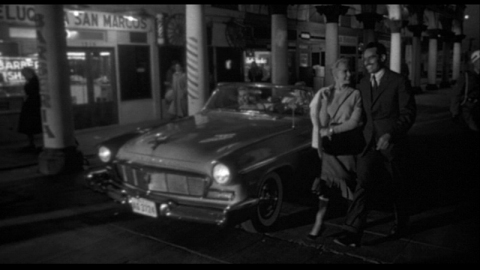 Few films in the history of world cinema can match the audacious opening shot of TOUCH OF EVIL. The camera tracks a bomb in a long take, as it travels through the busy streets of a Mexican border town. The camera’s tracking shot is seamless as it captures the complicated choreography of figure moment through the mis-en-scene. The stylistic flourish of the opening shot and the subsequent scenes could be viewed as artist indulgence, Welles arrogantly asserting his presence as the sole author of the film. However, he uses this cinematic trickery to create an organic blend with the thematic concerns of the story and engaging with the generic requirements of film noir in a bold and exciting manner. The restored version released in 1996 removes the imposed, non-diegetic, credit sequence and music that appeared in the original release at the studio’s insistence. Welles famously wrote a fifty-eight-page memo insisting that his original edit should have been released in order to reflect his vision. The unusual opening close-up of a timer being set by an unseen bomber plunges the audience into the narrative, there’s no establishing shot to place the action within a context, so they immediately begin to anticipate the explosion and questions begin to emerge: who is the bomber? Who is the target? And, when is it going to explode? The effect of this close-up for the audience is to make them complicit with the camera. The fluid tracking shot indicates that the camera is to be an omnipresent narrator, and an important presence in the film, as it soars above the car when the bomb is planted in the boot , surveying the scene which is unfolding below. Hitchcock said that there was no suspense in the bang, “just the anticipation of it”, and this opening shot makes the most of the ironic potential of the bomb to accelerate the exposition. In classical Hollywood films, stories follow a familiar pattern identified by Todorov in his studies on narrative: there is a period of stability characterised by calm and certainty; this is disrupted by conflict or event that unsettles the calm; and then the calm is restored as action is taken against the conflict. By the striking use of an impending explosion, it would appear that there is no calm in this narrative. However, the knowledge of what is about to happen is only experienced by the audience; the characters are unaware. Therefore the audience is in the privileged position of knowing more about what is happening than the protagonists. The irony of this relationship is key to the narrative of TOUCH OF EVIL, as it is concerned with the nature of evidence and how it reveals the truth. The camera picks out a smartly dressed couple who cross the road in front of the car containing the bomb and walk parallel to it as it weaves through the hustle and bustle of the streets. They reach the border crossing at the same time as the car, and have a brief exchange with the immigration officers checking their papers. The irony is laid on thick as the young woman in the car interrupts their dialogue to complain about “a ticking’ noise in her ear. The audience, attentive to the details of the conversation, learn that the two walking together are recently married: Miguel ‘Mike’ Vargas (Charlton Heston) is a Mexican policeman who has recently tackled the Grandi brothers. He makes the point that there are more Grandi brothers to deal with but he is more concerned with spending time with his new wife, Susan (Janet Liegh) and all-American, white, Anglo Saxon from Philadelphia (the home of American justice). Therefore a picture is painted of a wholesome, prim couple whose reason for crossing the border is enjoy chocolate soda together. When their first kiss is interrupted by the first cut in the film, marking the point of the explosion, there is an impetus to the narrative: will they return to their honeymoon and have soda together? Although the calm is short-lived, the moment that the Vargas couple celebrating their new marriage does provide the basis for a sense of order and wholesome stability that the rest of film is seeking to rediscover: “This could be very bad for us,” Vargas says to his anxious wife correcting himself, “for Mexico.” The other motivations for the story re quickly dispensed with, the audience are told who the victims of the bombing are and, the criminal and motive are unknown, it becomes clear from how the scene unfolds that these facts are less important than how they will be discovered. The first appearance of Hank Quinlan (Orson Welles) is juxtaposed against the smart figure of Vargas: he is bloated (Welles wore additional padding to fill out his already bulky frame). Although he wears the costume of a noir private eye, he is a policeman, an agent of authority who rails against the law he is employed to uphold. Unlike the private eye, he is not free, and this is a source of angst and bitterness (which manifests in hard drinking, candy munching and the planting of evidence to secure the conviction of the person he suspects has committed the crime). The camera, which has already been identified as the narrator, thanks to the opening tracking shot, indicates Quinlan’s skewed version of authority by shooting him from a low angle and an almost distorted frame. This deft use of the camera to provide an exposition is used with great economy. The opening shot, the explosion, the appearance of Quinlan are engaging incidents in themselves but it’s the skilful manner in which they create a moral context for the film that makes this one of the greatest films made. The next Film School is about Sound. The Main Feature is BLACKMAIL in the meantime, there’s a Dirk Five of Film School student’s selections of favourite Tracking Shot. Awesome post. I love learning about film school stuff. Didn’t Alfred Hitchcock have something to do with the tracking? I know his contribution made ‘Vertigo’ famous. A dolly-zoom? Reverse tracking, yes? Thanks Cindy – yes – Hitch used a number of great tracking shots and the reverse tracking was a bit of a signature. Great post, and very interesting. I love tracking shots, they nearly always impress me! It’s interesting that the recommendations that I got on twitter all seemed to work on the principle: the longer the better!